All NY Classical Theatre rehearsals and performances are Free and Open to the Public. Outdoor shows are not ticketed. 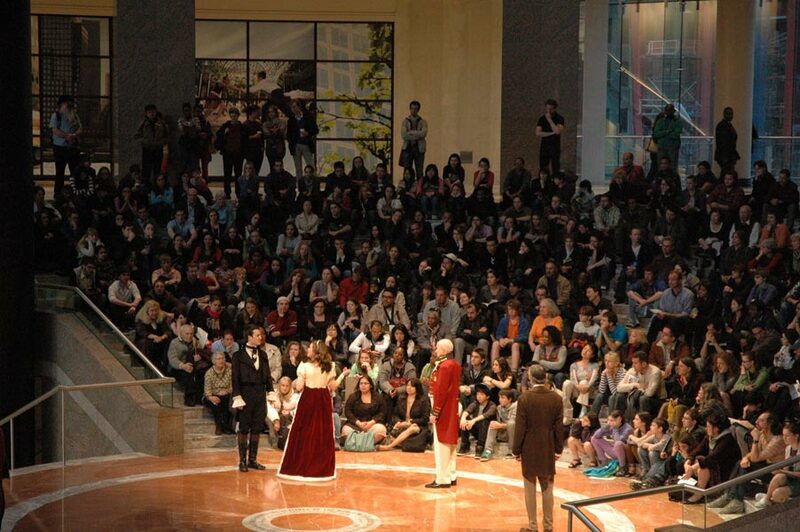 The audience follow the actors from place to place as the play moves from scene to scene. An average show covers approximately 3 city blocks over 2 hours. Check out our 3-minute video to see how it works! If the weather looks iffy, check the website banner for updates on that day's performance. · Do mosquitos love you? Bring bug spray! · We encourage pre-show picnics, but pack something simple that you can quickly pick up and carry during audience moves. (212) 233-6496 and we can arrange a special pre-show talk with Artistic Director, Stephen Burdman! * Did you know that for a $250+ donation, we'll send you a New York Classical Theatre water-resistant blanket? Check out our membership benefits! NY Classical strives to make its performances accessible to our whole audience! With advanced notice, we are happy to assign a staff member to help guide you along. For more information feel free to contact us before a performance at info@nyclassical.org or call (212) 233-6496. Please note: we need 24 hours to arrange a staff member for your convenience. · Free tickets will be distributed at each venue’s box office beginning at 6pm—on a first come, first served basis—the day of the performance you plan to attend. · Members of the Royal Court, beginning at the Lord/Lady level, are eligible to reserve seats in advance without any fee. To join the Royal Court visit membership benefits! · For non-members, a limited number of advanced “Refundable Reservations” are available at $30 per seat. · Immediately following the performance, those with Refundable Reservations will be eligible to receive a cash refund upon request at our box office. Refunds will not be issued at any other time. · All reserved tickets must be picked up by 6:55pm before the performance you plan to attend or they will be released to the general public. In addition, the fees for all unclaimed Refundable Reservations will be turned into tax-deductible donations to NY Classical Theatre—as a means of supporting our programming. · Be prepared to move seats at each act break. · Without an advance refundable reservation (see above) each person may pick up a maximum of 2 tickets. · All ticket-holders must be at the theatre by 6:55pm, or your seats may be re-assigned to someone on the stand-by list. · For parties and groups of 6 or more, contact us in advance at (212) 233-6496 to make special arrangements. · Don't want to risk missing out? Check out our membership benefits! NY Classical strives to make its performances accessible to our whole audience! For additional information or if you have questions, please contact us at (212) 233-6496 (voice) or info@nyclassical.org.